Located on the right side of the Algo Dashboard window is the Algo Orders pane. 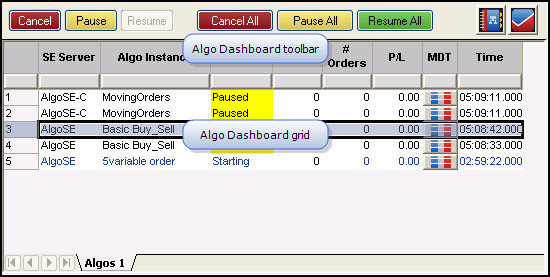 At the top of the Algo Orders pane is the Algo Dashboard toolbar, which allows you to cancel, pause, or resume algos. Directly below the toolbar is the Algo Order grid, which contains algos that have been started by you or people with whom you share this window. Note: Algo orders can also be managed from the Orders and Fills Window and Parent Order Book window. The buttons on the Algo Dashboard Toolbar can be applied to more than one algo at a time. When multiple algos are selected, and an action is taken that applies to some of the selected orders, only the pertinent orders will be affected. For example, clicking the Resume button on multiple orders will only resume actions on those algos that are currently in a Paused state; the Resume button will not impact the other selected non-paused orders. Displays the order details in a ticket format. Terminates one or more selected algos and removes canceled algo parent rows from the Algo Orders pane. If Leave Orders on Cancel is enabled, working child orders are left in the market. If Leave Orders on Cancel is disabled, working child orders are canceled. Stops all further actions on one or more selected algos in the Running state and continues to display the paused algo order rows in the Algo Orders pane; changes TTStatus field to Paused with a yellow background. If Leave Orders on Pause is enabled, working child orders are left in the market. If Leave Orders on Pause is disabled, working child orders are canceled. Resumes actions on one or more selected algo in a Paused state. Cancels all algos displayed on the current Algo Orders pane tab and removes canceled algo rows from the Algo Orders pane. Stops all further actions on all Running algos displayed on the current Algo Orders pane tab and continues to display the algo rows in the Algo Orders pane. Resumes action on all Paused algo orders displayed on the current Algo Orders pane. Launches the Parent Order Book window filtered with the selected orders. Note: You can also use the Algo Orders pane context menu to launch the Parent Order Book filtered with the selected orders. Launches the Orders and Fills Window filtered with the selected orders. Note: You can also use the Algo Orders pane context menu to launch the Orders and Fills Window filtered with the selected orders. Note: The Pause All and Cancel All actions do not apply to algo instances hidden by filters applied to the displayed Algo Orders pane. The Algo Dashboard grid is located below the Algo Dashboard toolbar and contains algos that have been started by you or people with whom you share this window. As with other grids in X_TRADER, you can configure and filter columns to display the desired information. Note: When a running algo has one or more working orders the row displays light purple. This color can be changed from the Colors tab within Properties. Right-click within the grid and choose Show/Hide columns from the context menu to display additional details about the algo. For a complete list of columns available in the Algo Dashboard window see Algo Dashboard Column Descriptions.